The Sure Hotel, formerly The Quality Inn, is a three star hotel located eight miles from Birmingham airport. The Best Western Sure Hotel is an excellent base for access to Birmingham Airport, Coventry, Stratford-upon-Avon, Warwick, the NEC, and the Bullring. Excellent service, friendly staff and well organised. As travelling early hours it was less stressfull and hotel easy to find and quiet. The Quality Inn we stayed was very 'tired' and the bed uncomfortable. The taxi service was top rate. Hotel as described, helpful staff, a good deal for 1 night stay,car parking and airport transfers. Our customers rated Sure Hotel on average 9/10 (77 reviews). Read Sure Hotel reviews. The airport is around 15 minutes away from Airparks, via the included shuttle bus. 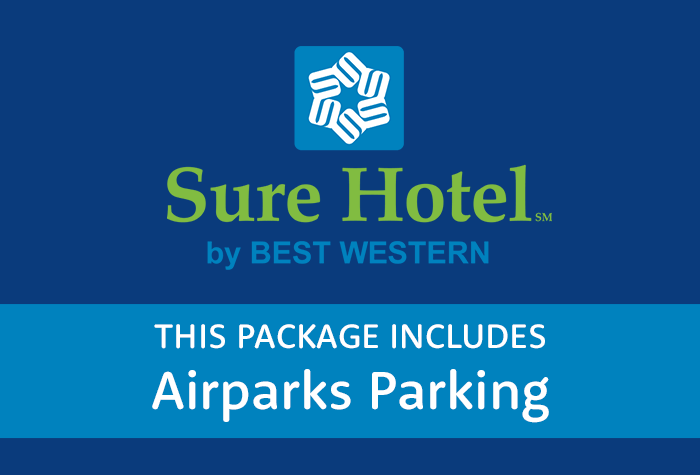 The Sure Hotel is around 15 minutes drive from Airparks. Directions and a postcode for satnavs will be on your confirmation email. This package includes parking with Airparks for the duration of your trip. Park in the hotels car park overnight, its included in the price. In the morning, drive to Airparks. Once youve parked your car, take the shuttle bus to the airport. It takes 14 minutes and runs every 25 minutes, 24 hours a day. Guests tell us the rooms are warm, clean and practical. Wifi is free throughout the hotel. Guests tell us its fast enough for streaming films and music. The Pillars Restaurant serves a range of classic dishes from locally sourced ingredients. Open from 6pm - 10pm Monday to Saturday. The bar serves beers, wines, spirits and soft drinks, as well as tea and coffee. Open afternoon - evening daily. Breakfast is an English and continental buffet, served in the hotels restaurant, costing £8.95pp. Served from 7am - 9.30am daily. Disabled facilities A double room is available on the ground floor with access. Drive to the hotel - directions and a postcode for satnavs will be on your confirmation email. Park in the hotels car park and check in for the night. Drive to Airparks. Once youve parked your car, take the shuttle bus to the airport. It takes 14 minutes and runs every 25 minutes, 24 hours a day. Once youve collected your luggage, take the shuttle back to Airparks and collect your car.